written and compiled by independent musician/author Nick Venturella. 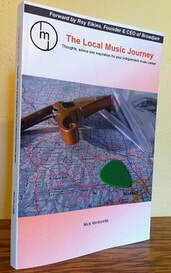 ​The Local Music Journey: Thoughts, advice and inspiration for your independent music career offers practical advice and tips for those beginning their indie music career and for those veteran indies who need to refresh their indie music drive. Beyond the useful advice that you'll be able to apply to your indie music career immediately, the book is full of insightful interviews from independent musicians and music professionals. The interviews offer positive encouragement and camaraderie, which is needed among our growing indie music community. The idea is that even in this internet-age by being a resourceful, entrepreneurial independent musician success on a small level will build toward successes on a larger level. That said, by starting one's indie music career locally it can allow for some immediate successes that become steps toward regional and even national successes--start locally, and then take over the world. The book started because indie musician, Nick Venturella, was searching social networking sites admiring some of the internet marketing successes of his fellow Wisconsin indie musicians, and he realized that others may do the same thing. The question became: Why not use social networking to capture interviews of some of these indie musicians to share with a larger indie music audience who could benefit from the information shared? Hence, The Local Music Journey book began, and later Venturella started this site. 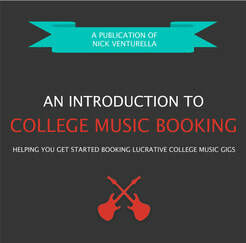 This is powerful guide to help musicians get started booking well-paying gigs in the college music market. Learn to Accelerate Your Music Career's Earning Potential With Good-Paying College Gigs. Use This Guide’s Marketing Templates to Help You Book Your College Gigs.